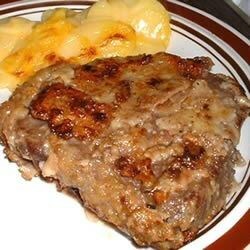 "Tasty chicken fried steak that's easy to prepare. Serve with scalloped potatoes for a real hearty meal." Pound steaks using a meat mallet to tenderize. Place in a shallow glass dish, and pour the vinegar over the steaks so that they are covered. Refrigerate for 30 to 45 minutes to marinate. Heat oil in a large skillet over medium-high heat. Beat eggs in a shallow dish, and set aside. Place flour in a separate dish. Dip steaks in flour, then in egg, then in flour again. Place in the hot oil, and fry on each side until deep golden brown, about 4 minutes per side. Remove to a paper towel-lined plate to drain. Serve immediately. See how to make Southern chicken-fried steak with gravy. my family did not like this recipe at all. My husband, who is the least picky eater in the world and who has been very patient with my attempts to try new things, did not enjoy this. We made Hamburger Helper instead. As a vinegar fan, this struck up my curiousity, and I thought it was going to be good...I was wrong. Will never be making this again.